Home » Heating and Cooling » Best Pellet Stove 2017 – Don’t Buy Without Reading! Best Pellet Stove 2017 – Don’t Buy Without Reading! Welcome to the definitive guide to finding the best pellet stove today! A pellet stove is characterized primarily as being a cleaner and more economical source of heat than other methods we use to heat our homes. With the cost of other types of energy such as light, natural gas, diesel and even wood continuously increasing in price, more and more people are putting their trust in the pellet stove to spend the coldest months of the year a more affordable, and earth-friendly way. Pellets are a 100% renewable fuel source with very low emissions when burning compared to other fuels; additionally, their price is much lower in comparison to other fuel types. Throughout this comparison of pellet stoves, also known as biomass stoves, we will not only show you the most economical and efficient models today, but we will also review the savings of them compared to traditional wood and other fuels. 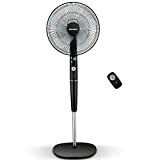 Being realistic, in practice, buying one of these is similar to buying an electric radiator or a butane stove, as they are all heating systems, each with various aspects we should know about. The operation of biomass stoves is similar in all of them, but before you decide, you must take into account all the features that can make your purchase a real success. Power: As with many other devices, power is one of the aspects in which we first focus our attention. In the case of this type of stoves, manufacturers usually show the power in kilowatts (kW) and BTU’s. In the market, we can find models with capabilities that can vary between 6 and 14 kW. Obviously, the more power the unit has, the larger the area we will be able to heat with the same machine. Of course, if we intend to heat large homes and living areas, the power is equally as important as the location in which we place the stove and the layout of the house. Area to heat: This is another important aspect that is directly related to power. There are some manufacturers that offer us this data in square feet, while there are other brands that give us this number in cubic feet. Pellet tank: The main advantage of this type of stoves is that the fuel supply is very fast and clean, unlike other heating systems such as firewood. The stoves have a tank, or hopper, of a certain capacity in which the pellets will be stored. In smaller models, the hopper usually has a capacity of about 33 lbs, which closely resembles the weight of a bag of pellets. The greater capacity is better since we will have to recharge the pellet machine much less frequently, but it should not necessarily be a determining factor when choosing. The capacity can range from 30-70 lbs in the case of air pellet stoves, but then there are biomass boilers whose tanks can be 220 lbs or more. Performance: Performance is a number provided by the manufacturer and should not be overlooked. One of the main characteristics of the pellet as a form of heating is that it offers a very high yield. Always choose a stove model that has a performance rating of at least 80%. Interior material: Pellet chimneys can be made with different materials inside that directly influence their final price and performance. We can find machines with vermiculite or cast-iron coating. The best is undoubtedly cast iron, as it withstands high temperatures very well and is also able to store the heat for much longer, even when the stove has been turned off. Fuel consumption: The consumption of pellets in some way is also linked to performance, so it is another aspect that we must consider when deciding which pellet stove to buy. The manufacturer itself usually indicates the maximum and minimum consumption, although this value also depends on the power of the machine. Consumption is expressed in kg of fuel per hour. Generally, most models range from 1 lbs. per hour minimum power and up to 6 lbs. per hour for maximum power. Control panel: Today it is very difficult to find pellet stoves that do not have a control panel with which we can adjust the temperature to our needs at any time. They are intuitive panels, and in some cases, have programming to decide when to switch the stove on or off depending on the hours or temperature. 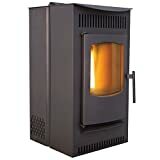 Safety: Pellet stoves incorporate a multitude of safety systems to avoid any kind of mishap. In the presence of low oxygen or too high a temperature, it will automatically shut down and lock until the conditions are optimal to start working again. Extra options: There are some stoves that can be controlled remotely, either from a remote control or from a smartphone. The latest trend is the pellet stove with Wi-Fi, which allows us to turn it on or off from anywhere, so when we get home the room already has the temperature we want. If you tend to spend a lot of time at home, this additional feature may not be necessary, but if that is not the case then it could come in handy. Following these tips to know which pellet stove to buy, let’s look at the types we can find in the market so you know how to choose your stove. Air pellet stoves are, as its name indicates, the stoves that burn the pellet and expel the heat from the combustion chamber to the room in which it is installed. They are the most common and the least expensive since their installation is very simple. The canalizable pellet stove has a very important peculiarity, and that is that they are able to warm the room in which they are installed and stay contiguous. This is possible thanks to an additional pipe that it has at its rear, to which we can attach a tube to expel heat to other rooms. They are somewhat more expensive; however, it is a good option. The pellet thermostats work in the same way as the air stoves, but they also have the capacity to heat the water of the radiators and thus make the most of their power. They are more powerful, they usually have a larger fuel tank and when it comes to fully heating a space they are much more efficient, surpassing 90% of performance. Location of the stove: The place where we decide to install the stove will depend on the heat being evenly distributed by one or several rooms. In the case of multi-story houses such as chalets or semi-detached houses, ideally, it is installed in a corridor or place where the stairs are close (as long as they are open, of course). The heat always tends to rise, so we must think about this first of all. If it is not feasible to install a traditional stove, we can also resort to canalized wood pellet stoves or pellet hydro-stoves. Fume Extraction Tube Diameter: With a few exceptions, the air pellet stoves have a smoke outlet with a diameter of 80mm. In the market, we can find different types of tubes: vitrified, stainless steel and double layer stainless steel. In order to avoid problems of smoke reverting or poor performance of the stove, it is best to use a double layer stainless steel tube, as it is correctly insulated and prevents a temperature difference between the stove smoke and the cold air of the stove. 220V power outlet: All pellet stoves need an electric current to operate, so in any case, the location we choose must have a plug near to start the machine. The control panel, the worm that moves the pellets to the combustion chamber and the ignition parts need current to operate. Other Aspects Regarding Smoke Extraction: Whenever possible, the pipe should have the least possible horizontal or 45-degree angles. The more verticality the tube has, the better the performance. The price range of these units is quite variable; depending on the power, type of stove, the capacity of the tank or the additional options available to the stove. If you do your research, you can come up with a great deal on exactly what you’re looking for. We hope this guide to the best pellet stoves has been useful for you to choose the model that best suits your needs!